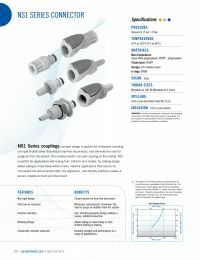 NS Series couplings are the smallest plastic non-spill couplings on the market. This compact, closed-system design is packed full of features which includes non-spill shutoff valves that ensure drip-free disconnects, and eliminate the need to purge air from the system. NS1 is perfect for applications using tubing from microbore up to 1/8-inch. Its rotating design allows tubing to move freely without kinks making it ideal for applications that need to be connected and disconnected often.